EDGECAM 4 & 5 Axis Machining. EDGECAM seamlessly integrates 4 and 5 axis simultaneous machining within its milling and mill/turn environment to allow a range of multi-axis cutting strategies to be applied to the most complex tooling or components. EDGECAM offers a wide range of 4 and 5 axis strategies applicable to solid and surface geometry. Reduced fixturing, as the cutter can be presented to the component at any required angle. 3 to 5 axis Tool Path Conversion. Using the knowledge of 3 axis machining methods, the standard EDGECAM milling cycles and operations can be used on a component then apply the 5 axis tool path conversion. This produce 5 axis movement where required, ensure tool lengths are kept to a minimum and the cutting tool and holder tilted away from the component avoiding any collision. 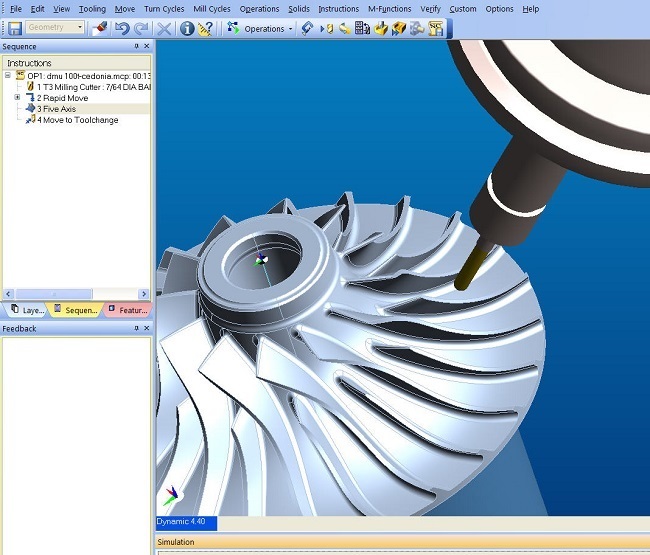 This methodology is an easy way to move into 5 axis programming technology. Use the 4th axis rotary attachment on the milling machine to produce a turned shaft using milling cutters rather than using a lathe for a partial operation. This process relies on the percentage engagement of the milling cutter while rotating the component which is made simple using EDGECAM. The same principal is also used to produce cam forms. Five Axis Finishing Five axis finishing across multiple faces is similar to a parallel lace or scanning tool path but controls the tilt relative the surface which is driving the cycle. SWARF Milling Side Wall Axial Relief Feed. This is common practice when driving the side of the tool along a surface which tilts from side to side, this is in common practice on many aerospace parts. The tilt is control by the surface wall and the tool lift controlled by the base surface or bounding curve. 5 axis machines are also capable of 5 axis positioning, also called 3+2. This is where the component can be positioned using a combination of 3 axis linear movement with 2 axis rotary movement. A standard 3 Axis machining method can then be applied on to the component face orientated towards the spindle. These tool paths may also have the 3 to 5 axis conversion applied. 5 axis tool paths can result in large movements of the machine tool from what can be a very small cut on the component. These movements can cause severe damage the part and machine. EDGECAM provides methods for collision avoidance where the cutter and holder are checked for collision and the necessary tilts applied to move away from the potential collision area.